The Balanced Energy Network (BEN) is a pioneering energy network that will use heat pumps to extract heat from water circulating between buildings to disperse heat to other buildings and transfer cold water to buildings needing cooling. A consortium of cross-sector partners led by renewable energy firm ICAX in partnership with London South Bank University (LSBU) has been awarded a £2.9 million grant by Innovate UK, the UK’s innovation agency, towards this £4 million project to build BEN on the University’s campus. 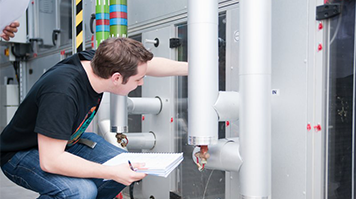 The network will help LSBU save energy and reduce costs without emitting carbon dioxide on-site or any other environmentally damaging gas. Only 2% of the UK’s built environment heating demand is currently delivered by heat networks. The Government is aiming to increase this capacity to 15-25% by 2050 by encouraging organisations from different sectors to come together to develop new low energy supply networks through Innovate UK’s competition. The consortium’s ambition is to demonstrate how ‘cold water heat networks’ might become the ‘Intranet of heat’, enabling communities across the UK to develop economic heat sharing networks. BEN will transfer solar heat collected in the summer into thermal energy to be stored in the ground through autumn until it is needed to heat buildings in the winter without burning fossil fuels. This process will be controlled virtually and allows heat pumps to respond to low price supply when the grid has surplus electricity. Construction is now underway. BEN is being developed by ICAX with support from LSBU’s Centre for Efficient and Renewable Energy in Buildings (CEREB) in collaboration with a range of consortium partners including the Greater London Authority, Mixergy and Terra Firma Ground Investigation. Upside Energy’s cloud-based software creates a ‘virtual energy store’ which allows energy surpluses to be sold back to the grid and allows heat pumps to respond to low price signals when the grid has surplus electricity. A leading industrial refrigeration company is developing compact heat pumps capable of delivering high temperatures to large buildings. Carbon-negative technology company Origen Power is working with Cranfield University to provide a new energy generating product that removes carbon dioxide from the atmosphere. “BEN will answer the Energy Trilemma by providing a mechanism for transferring heat from buildings that require cooling to buildings that require heating – thus providing a ‘heat sharing dividend’ to both buildings, and to the planet,” said Mark Hewitt, Director of ICAX. “We are delighted to have the opportunity of extending CEREB’s teaching and research functions in the built environment to community scale by creating an exemplar 4th Generation district heat network on site to demonstrate what can be achieved through intelligent design,” said Professor Andy Ford, Director of CEREB and Professor of Building Systems Engineering. “LSBU is committed to working with innovative companies to help create a more sustainable future for society. BEN is another example of how our academic experts collaborate with leading-edge industry partners to drive innovation and help our planet,” said Howard Thomas, Head of LSBU’s Sustainable Communities Institute.